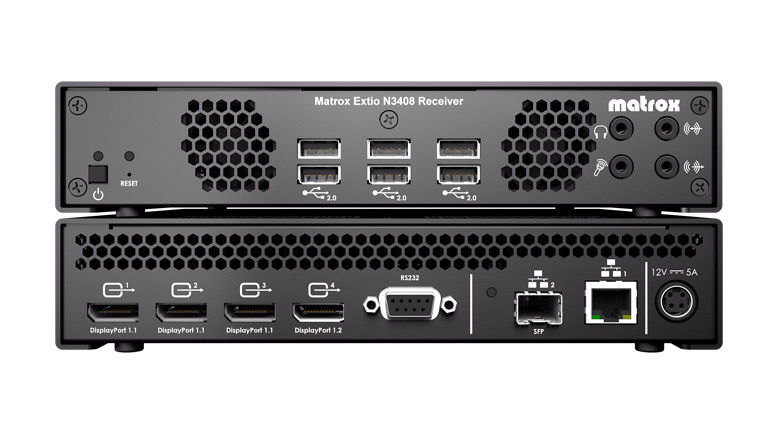 Matrox® Extio N3408 are the world’s first IP KVM extenders to deliver 4Kp60 4:4:4 UHD performance or quad-display capabilities over standard Gigabit Ethernet at unprecedented low bitrates. Extio N3408 can be configured as a point-to-point or networked KVM extender, extending multiple video, keyboard, mouse, USB 2.0, and audio signals using a single fiber optic or copper cable. You require a Transmitter appliance to connect to the Computer. environmental hazards, and reduce system noise and heat emissions. government, broadcasting and post-production, and many other industries and applications. Extend ultra-high resolution desktops (3840x2160 @60Hz) at unprecedented low bitrates with the world’s first 4Kp60 4:4:4 IP KVM extender. Support quad-monitor configurations (4x 1920x1080 @60Hz) with a single transmitter and receiver pair, improving operator workflow across an expansive multi-monitor workspace. Deliver pristine image quality, smooth video playback, and excellent keyboard and mouse responsiveness at a distance with Matrox-patented technology. Transport signals over copper cabling, or optionally upgrade to multi-mode or single-mode fiber optic support.